These White Castle Sliders are delicious! For those of you who have always wanted to duplicate these sliders at home, this recipe is the real deal. Here is one for all of you out on the East Coast (there aren’t any White Castle’s out here in the West). White Castle Sliders are SO GOOD! I have only had a White Castle burger once and I loved it. I remember thinking I needed to figure out HOW to make White Castle burgers. I tried a few recipes but none of them seemed right until I found this recipe on the Cooking With Carrie Blog and I made a few changes. These turned out so good, just how I remember them tasting! And what’s really great about them is you can have them for lunch the next day. Just pop them in the microwave whole for about 30-40 seconds and they taste just as good as the night before! You can even try freezing them, just be sure to thaw them out before microwaving so it cooks evenly. Some people are skeptical about the peanut butter.. it adds a texture that is difficult to substitute but if you have a nut allergy or just can’t do the peanut butter, feel free to leave it out. Others have wanted to leave out the onions… again, only do it if you must! In my opinion, the onions add such a wonderful flavor that just can’t be duplicated. 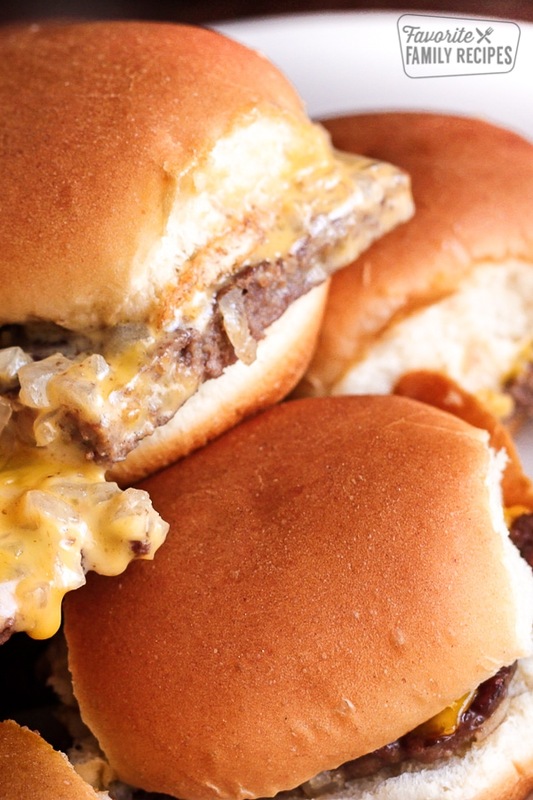 For those of you who have always wanted to try White Castle sliders… this recipe is for you! We have had such great feedback with this recipe from those who have tried it and LOVED it. See for yourself! I have eaten at White Castle again since writing up this post and I can definitely say that these taste just like the original White Castle burgers but in my opinion this recipe tastes even better because you know EXACTLY what is in them, and they don’t seem as greasy. 1 tablespoon peanut butter (Yes, peanut butter. Trust me. In a large bowl mix the ground beef, Lipton onion soup mix, peanut butter, and milk. Spread the meat mixture on a cookie sheet. Use a rolling pin to roll over the meat to smooth it out. Bake at 350 degrees for about 10 minutes. The meat will shrink. Take it out of the oven and put the diced onions all around the edges, this will give the meat a great flavor. Bake for 15 more minutes, remove from oven, then spoon the onions from the edges all over the top of the meat and layer with cheese slices. Bake another 7-10 minutes (until cheese is melted). Remove from oven and add the tops of the rolls (the bottom part of the rolls will just sit on the counter) and place back in the oven for about 5 more minutes. Take it out of the oven. Slice the meat with a pizza cutter and pick up the slider/top bun with a spatula and set it on the bottom bun. Love Sliders? Check out these other delicious recipes! Mushroom Swiss Roast Beef Sliders: If you are looking for the perfect appetizer for the big game, look no further than these Mushroom Swiss Roast Beef Sliders (with an optional Blue Cheese Horseradish Sauce). Caprese Chicken Sliders: These Caprese Chicken Sliders are a tasty Italian style appetizer. The grilled chicken is a must! A fun “fusion” finger food perfect for any party. These look delicious! What a great idea to put the meat on a cookie sheet. That makes it really easy to make. Thank you for all of the great ideas and recipes. I made these last week and I am a HUGE white castle burger fan! These are fantastic! My sister came over and she could not believe how great they tasted! Very Easy! and they do freeze well as stated! I only had a baking sheet and no rolling pin. I put the mixture on an 11X17 sheet and covered it with plastic wrap. I then used another baking sheet and flattened it out. Worked good. Came out very good. Thanks. NO Peanut butter. Ruined all of it !!! How could the peanut butter ruin it? I only used a pound of hamburger because it’s what I had. Still used the tablespoon of peanut butter. I didn’t taste it at all! Unless someone has allergies I can’t understand how they could be ruined? I certainly agree! You cannot taste the peanut butter at all! I completely agree cuz I put peanutbutter in mine and it was horrible..
Then you used too much. We can’t taste it. I live near Chicago and the peanut butter gives it it’s “unique White Castle” taste. I make these over and over again, even though White Caste is literally 2 miles from me. Plus, it’s way cheaper! My local grocery store wanted 9 bucks for a frozen box of wc burgers. I bought the ingredients I needed for 5 bucks. Never had a wc burger before so I won’t be able to compare but they always look so yummy on tv. My dad has used peanut butter for burgers since I was a kid. Oh my gosh these were good. I’m going to say it: they were way better than any WC I’ve had. I only had a lb of 93 % lean and it shrank down to perfectly fit the slider buns. I left the onions off a quarter of it for my onion-repulsed son (but used the soup mix and he didn’t notice). It was the first dinner in a long time that he didn’t ask how many bites he had to eat. I recently discovered your blog and bought both cookbooks. I’m an instant fan! Thanks! Wow Melissa, than you so much!!! What a huge compliment! Thank you for purchasing our cookbooks! We hope you and your family will continue to enjoy our recipes 🙂 You totally made my day! How did I not know about this blog before? Looks awesome!! I'm trying these tonight. Made these tonight. Huge hit! Husband says they are better than the real thing! Thanks! I was not sure about the peanut butter, LOVE IT. This is a keeper. Thanks for sharing..
Do you have to put in the peanut butter? Nut allergy in family. You can try it without! It might not be as creamy but ya gotta do whatcha gotta do! Try substituting tahini for peanut butter. I tried it and really liked it. Have you tried Wowbutter? It is a soy-based, nut-free substitute for peanut butter and it tastes virtually identical to the real thing. Very tasty. It’s the peanut butter that gives it the white castle burger taste, otherwise it’s just burger and onion. You can skip the peanut butter and use a jar of veal baby food instead. Google white castle copy cat burgers using baby food veal for the exact recipe. You’re welcome! Want to try these but I am allergic to peanuts. Any substitute suggestions? I would try almond butter (if you aren’t allergic to almonds) or just leave that part out. It will still taste fine. Try sun butter. It’s made from sunflower seeds. Very similar to peanut butter taste. Baby food veal instead of peanut butter. Google the exact recipe for measurements. You’re welcome. Just finished eating these for dinner and they were wonderful! The only change I made was using potato bread rolls instead (just personal preference). Thank you so much for this great recipe that will be joining the monthly rotation! These are so good! My kids loved them! I am sending the left overs with my son to school lunch tomorrow. He is so excited to show them off to his friends. These were AMAZING!! Taste just like Krystals which is pretty much the same as white castle.. We don’t have white castle here. I just added a lil ketchup mustard and pickle just like Krystal’s!! Yummm thanks!! Sorry, but I dont agree with that. Krystals does not taste like WC at all. There is no comparison. Had Krystals once and never had them again, even the kids didnt like them. THERE IS NO REPLACING A WHITE CASTLE BURGER! I am 66 years old and I love WC. I use to live on them . Only we got them for 10 cents a piece. If I lived close to one I would be still getting them. The town HAD a Krystal , but it closed, tried it once never went back. Sorry Krystal you ain’t WC. AMEN!!! I live in GA where there is only Krystal-no WC whatsoever! I’m from Louisville, KY where there is only WC, so it’s very hard for me, because I’ve been a White Castle fanatic my whole life! My husband, however, who is a born and raised Georgian, had never had WC until I had a friend who was visiting from Ky bring me a sack of 10. Although he was reluctant to admit it, FINALLY admitted that WC is far superior to Krystal! I went back home to Ky several months ago and ate there around 4 times in 5 days AND brought some home…on the Greyhound! I said all of that to say that I can’t wait to try this recipe! The ones in the freezer section are NOT the same!!! Brenda, I’m 62 and I remember when you could get WC for 8 cents and I thought it was outrageous when WC went up to 10 cents…lol (gas was also about 25 cents a gallon …those were the days my friend). I lived in Missouri at that time. Now I reside in Texas with no WC. I was so excited when Krystal burger came to town. I heard they taste just like WC. I tried Krystal’s once and never went back. No comparison. WC burger meat to me has the soft consistency of a meat loaf and to get that texture you add socked bread with water squeezed out to the meat recipe. That’s probably what the peanut butter does in this recipe. So if you have a peanut allergy try the soaked bread instead. I can’t wait to try this recipe as is and then I will rate it. Replace peanut butter with baby food veal. Google for recipe. Sorry, I have lived in Ga most of my whole life and eaten Krystals since before I can remember and they are the BOMB!! I lived in Cincinnati where I first tried White Castle. They are basically the same. The only difference in the 2 is the condiments they put on them. I love them both but feel there is no difference. I am trying this recipe tomorrow. My sister n law made them before and instead of the peanut butter her recipe used gerbers beef baby food. Not sure about that one but I will try the peanut butter. I’ve had both many times and, honestly, I can’t tell the difference. I’ve had both, and enjoyed both.. to me, they both taste the same. Happy with either. BTW, I’m doing these this week and can’t wait. Peanut butter? Ok, if you say so, and the other members liked it, I’m in! This post is now like 7 years old or so, and now the grocery stores actually sell ‘slider’ buns. Cool! 😀 Thanks for all your nice comments Steve! Absolutely I am from the Bronx NY where White Castle originated. I now live in Florida and tried the Krystal burgers”yuck” there is nothing like WC. I wish I could have someone buy them for me from the Castle and send them to me. Everyone say buy rhem frozen NOT THE SAME. I MISS THEM. WC originated in Wichita, KS ! I live in Kansas and I have yet to see a daggone WC! I always have to wait till I drive to Kentucky to get a WC! FYI: Krystal’s is NOT the same! No, Krystal does not taste like White Castle. I am from Indiana and grew up on White Caste burgers. Then, we moved here to SWFL and there are no White Castles. I am so glad I found this recipe and can not wait to try it! Do Krystal have Ketchup they are actually my favorite but I don’t remember ketchup ? Krystal’s does not use ketchup. I ask White Castle not to put ketchup on my burgers. I personally like Krystal’s better (I grew up near Savannah, GA) but they are very similar, just one has ketchup (WC) and one has mustard (Krystal’s). White castle does NOT put ketchup on their burgers. Had these for dinner tonight and OMG….they were DELICIOUS!!!! Sounds delicious – I’ll definitely try these! (Just a note – you might want to look over your instructions. Some of the steps are listed multiple times, and it’s a little confusing.) Thanks very much for sharing! Thanks for catching that!!! Some of the instructions must have gotten copied over twice when we did our new format. I fixed it, it should make more sense now. Thank you again, I hope you like it! Can you leave the onion soup mix out? Onion allergies. Sure.. Maybe just use a beef broth mix? Made these tonight for dinner. AWESOME! I had to drain grease off each time I did the next step but not a big deal. Next time I may try lower fat beef next time. Simply delicious! I followed the recipe exactly and so happy I did. Thank you! This sounds great, I am a bit taken aback by the use of peanut butter however I will try this after reading all the comments. You did forget one item that is part of the White Castle burger… the dill pickle slice. Thanks for taking the time to share this with us all. Can you tell me the dimensions of the cookie sheet that you used? Thanks! Just curious what size cookie sheet? Is that a silly question? Very excited about this recipe though the peanut butter has me intrigued! My hubby loves White Castle I have never been because the closest one is about 60-70 minutes from here! I think it is like 12×17 or 12×18. Just your typical size. Gotta admit I was skeptical about these, having grown up in Brooklyn, New York where White Castle is plentiful. I decided to give these a try due to the fact that now I live in Southwest Missouri and can’t get them. Gotta say I’m impressed, they’re really good and pretty darn close. Kudos!!!! These were DELICIOUS and as close to White Castle as you can get. I did add a dill pickle chip and used Kroger slider buns….. I like the idea of dumping the grease after each step and will try that next time because I will make them again! I made these for first time for my husband. I ended up using 2# hamburger. It ended up making them a little bit thicker. Still good. I was told I forgot ” pickles”. I was skeptical on the peanut butter as well. All turned out. Making them again tonight. I’m going to try these even the pb ;o) I’ve been craving wc but the closest place is like an hour away. I even wrote wc and they aren’t going to put one here. My husband and I wanted them so bad back home for yrs but it was only 1/2 hr away to Indy or Greenfield to get them. But the yr after he passed away the finally built one in our town but I had moved to Ky. The ones in the store just aren’t the same either. So I’m going to try these instead. thanks for the receipe. These turned out absolutely amazing! Tastes just like the original…we added yellow mustard and pickles. If you like White Castle and/or Krystal, you’ve got to try this recipe!! Easy to make. I’d cut back on the peanut butter a bit, but otherwise a great turnout. Used potato rolls. I agree with this comment. A little too much of a PB undertone. But with this in mind, I will try to remake with half of it and see how it turns out. Thanks for the recipe. Loved these! However, instead of pushing bottom of buns to the side, I toasted them. Then I put mustard, ketchup, & a dill pickle chip on them. I did put mayo on some of them since I am a mayo person! I made these for some coworkers the other night (Thursday), it is now Monday and I have made them seven times. The last two times were double batches. These are just outstanding! And, I trusted you, the peanut butter really works and is also what intrigued me about them in the first place…plus I love the look on people’s faces when I tell them what the ‘secret’ ingredient is. I am so glad you (and your co-workers) liked them! I always make them around this time of year because it is so much easier than making individual burgers. Thanks so much for the comment! How many sliders does this recipe make? about 12-16.. depending on how big your slider rolls are. Hi, what if I use turkey instead of beef? (I dont eat red meat) Will the peanut butter still be effective? Haven’t tried turkey before… I don’t know how it will affect the taste/texture. Sorry! Wish I was of more help! Ummmmmmm -the Midwest is NOT the East coast – we are the MIDWEST. Sliders are the product of a chain restaurant called White Castle. I lived long enough in the bay area to be amazed how little most residents are of the USA beyond the west coast. I’m not sure why you are so upset. The White Castle burger I had was in New York. What?! Surely you realized it’s a chain. It’s based out of the midwest. It’d be like saying you made In and Out in honor of Utahns. Sure they exist in Utah, but they aren’t FROM there! 🙂 Plus we Midwesterners tend to get disgruntled when others forget about us for the coasts. Frankly, it looks ignorant. When I saw “East coast thing” I was confused as well LOL I grew up on White Castle in Illinois and Missouri, and they were actually founded in Kansas. It’s good to see they’ve branched out so far though, but I wish they had some in Texas! The ones from the freezer section at Wal-Mart aren’t even close! Thank you for the recipe Erica! Going to make these for my family for game day! Im excited! Wondering if you can use avacodo instead of peanut butter? Maybe I’ll try it both ways. Yeah, I don’t know. We have only made it with PB. Let me know how it works out with avocado! Made this for game night! My boys loved them!! Yum!! These are delicious! We had them for dinner tonight. My daughter, who says she does not eat meat, ate several of them then wrapped all the left overs in plastic to take to school tomorrow. They are the closing thing I have found to White Castle since I lived in New York 39 plus years ago. From someone who worked at white castles, this is not even close to the way the tasty little treasures are made. First you dont use lipton soup or peanut butter…not sure where that came from. What you do is you soak dehydrated onions in a pot of water until they are plump again. then you cover the bottom of a cookie sheet with the water and onions. (this is what gives the bread that soggy goodness) then you place your flattened burger patties then the bottoms of the buns go on top of the burger and then you place the top bun over the cracks between each bottom bun and the next bottom bun. They put in the over until done. thats it…its simple. Cheese goes on after they are done cooking and should not be completely melted like your pic shows. Tip it is better to use a covered stove top flat grill for these but the oven does just as good. Yes, I agree. Erica didn’t claim that her recipe mimics the true W.C. recipe. However, the blend of these ingredients do create a very close similarity in taste&texture. Reminds me of the concept behind Mock Apple Pie. Who would ever guess that the secret apple filling, isn’t really apples at all- but rather, crushed and spiced up Ritz crackers?! As for this slider recipe, Lipton soup sounds a lot tastier and easier than rewetting dried up onions. Just sayin…Don’t knock it til you’ve tried it. Thanks so much for sharing Erica. I think I may try it this way with the ground turkey because I can’t eat beef and I’m a little scared of the texture adding the peanut butter to turkey. May not have the same result. I was hesitant to try this recipe because of the peanut butter. I’m so glad I did. They were excellent and I had to make two batches. Will definitely be making these again.and by the way, no one commented on the peanut butter so they must not have tasted it. Better than White Castle. Thanks for the recipe. I’m a New York transplant in Texas. You literally just made my week. Thank you so much for this recipe! I can NOT find the Sara Lee Dinner Rolls 🙁 – I tried other rolls and it’s not the same – help! Yikes.. I don’t know what to tell you. Maybe King Hawaiian rolls? I made these burgers this past weekend. OMG! They r soo good. Thanx so very much for the recipe! Even my 83 y/0 mother thought they were “delicious!” Cannot wait to make them again! :-) thanks again! So glad you and your mom liked them!!! They are a favorite around here too! Unfortunately decided to make these last night for a party instead of using my trusted recipe… The peanut butter absolutely ruined my entire batch. My recipe is very similar but uses mayo and adds shredded cheddar to pan fried hamburger instead of milk and peanut butter. My recipe is MUCH MUCH better. Sorry…but this was barely edible. Sorry you had such a bad experience with the PB… we have never had it be overpowering like that before. What brand of PB did you use? Doubled this recipe for our Super Bowl party this year, and they were a huge hit! We are from the South and currently live in NOLA. Our closest Krystal is on Bourbon Street…not exactly the area a local wants to venture to when a craving hits…so these were a very welcome find! They were easy to make although they do require some babysitting because you have to do a step every 5-10 minutes. Totally worth it, though, if these burgers are your thing. We added yellow mustard and dill pickles to make them more Krystal like, and we served them on Hawaiian Savory Butter Rolls. I plan on making them again for dinner tonight! My brother-in-law is allergic to peanuts, so we have decided to use a tablespoon of cream cheese or mayo in place of the peanut butter when we make it for him. Great recipe! Thanks for sharing!! Hi!!! OMG!! This was just delicious!!! Perfect recipe, I have tried several recipies trying to get something like white castle’s burgers and this one won the price!! As i live in Dominican Republic I did not find Sara Lee´s bread, but I got some local soft mini burger bread very alike! My fiance is a huge white castle fan and he loved them!!! I have I little blog myself (www.voguecuisine.wordpress.com), and I would like to share my intake on your recipe, and also post your link so every reader will know is of your authoring, are ok with it? Please let me know! I actually didn’t like the peanut butter in these sliders. They were good overall buy I think I would do without that ingredient next time. Thank you for your comment! We may have other viewers that feel the same way. They would taste just fine without the peanut butter. Awesome recipe, tasted pretty close to the real thing. I told a WC insider friend of mine this recipe, he winked and suggested butter milk. I rushed home with some butter milk, made this again and it was spot on. Thank you so much for the tip! We will have to try it with buttermilk next time! Thanks for your comment! I do a very similar thing using French onion soup mix. It gives both a beef broth and onion flavor punch in one. PS: I now live in New Zealand so I have to resort to copycat recipes if I want the burgers. Do W/C use pickles or ketchup or mustard? I can’t remember and I want to recreate the exact burger. From what I remember, they don’t… anyone else have thoughts on this? White Castle does not put condiments on their burgers… Just the onion and pickle (and cheese if you order cheeseburgers). Packets of Dusseldorf mustard, mayonnaise, and ketchup are available in the restaurants. You are right! If you order them w/everything they come with the Dusseldorf brown mustard! No ketchup or mayo is included w/everything. This may seem like a stupid question. I’m wondering why would you cook the onions first around the edges of the meat and then after 10 min spoon all over the top of the meat and cook some more? Why not sprinkle the onion over the top of the meat to begin with? It would save a step. Does it make a difference with the flavor? Also, Do you not cook the bottom part of the rolls or do you stick those in the oven too? I have all the ingredients to make these tomorrow and I want to get it just right! We used to have White Castle in southern California a very long time ago and they were my favorite! I miss them so much and I’m super excited to try this recipe. Any responses would be appreciated! It softens them up better when they are around the sides. You can add them over the top but they might get too dried out. You can cook the bottom of the rolls if you would like.. it’s not a bad idea. Usually we just serve them straight on the buns and they are wonderful! Made these last night for my two picky eaters who seem to only like a few things to eat and my daughter doesn’t even like red meat but they at these. One a piece but at least they ate it because they usually eat much of nothing! So I would say these were a hit. My boyfriend even liked them and took the left overs to work! I’ve read almost all the conments. Several people asked about freezing them, but I didn’t see any reply. So can they be frozen? and if so, how long do you reheat them for and at what temp? And should they be reheated from fozen or thaw first? I would like to make these in advance of our get together but want to make sure they will turn out if frozen. You probably can freeze them but we have never done it before. I know they sell sliders in the frozen section at the grocery store so I don’t see why not! Let us know how it turns out! The only change I made was rehydrating some dried chopped onions and spreading those on the meat underneath the cheese instead of regular onions. I used the sweet hawaiian rolls. So darn good! Thank you for this recipe, the peanut butter is a winner! This will be a repeat in my household! GREAT idea rehydrating onions. That would make it way easier! I will definitely try that next time. So glad you liked the recipe! Thanks for your nice comment! Awesome Recipe, I’ve used it several times. The one thing I would recommend to people is you may need to drain the grease in between visits to the oven. On that note its especially important NOT to use a flat cookie sheet; meaning with no sides. That’s a big first timer mistake. These were awesome, I was a little skeptical on the PB but I made two batches one exactly as recipe calls and one with half the amount of PB I liked the one with half better, this may be because I use Natural PB. But these are a big hit. These are requested at parties and by my kids. Who by the way hate onions but do not question them on these burgers. Thanks for giving us the White castles anytime we want. Unless you have a PB Allergy you must try. Thank you for sharing your success with this recipe and your recommendations. I’m glad it was a hit! I just made these tonight and they were a huge hit. Taste just like the WC!!!! So glad you liked them!!! Thanks for commenting! These are amazing! Have been making them for about a year now and they get better every time! Great recipes and website. Thanks so much! Just came across this recipe from Pinterest, can’t wait to try it tomorrow! I grew up in Kentucky LOVING White Castle sliders! Just wanted to add that the chain uses Dusseldorf mustard, which in my opinion makes the whole thing. Just found it in my local grocery store for the first time marketed by White Castle, so these are on the menu tomorrow! Thanks! Thank for the tip! I will have to look for that mustard. My family loved this but while they where eating it I told them the secret ingredient was peanut butter. ..all they could taste after that was the peanut butter and all was wasted so dont dare tell ur family the secret and they will love it. Haha! Thanks for the warning! This recipe is not only delicious but fun! My granddaughters and I made an assembly line while constructing. The pb really makes this recipe. Thank you for such a wonderful recipe! Thanks Jane! So glad you and your grandchildren had fun making them. Well, I’ve tried many of these copycat White Castle Burger recipes over the past several years. And all of them were so-so at best…..until this one! Although I had to make some soft slider rolls as we don’t have them here in Western Australia, just BIG bready ones. (Oh, I’m American). And while its been about 10 years since I’ve had a WC, these were really really good. My wife, who’s Aussie, didn’t want to even try one until she saw them finished. LOVED them. In fact, I now have to make more on Thursday so she can bring them into her shop for her helper. THANKS!! These are delicious. I was’t sure about the Peanut Butter, oh my it does make this great! So easy to make. Thank you for a new recipe. I wonder what brand of peanut butter ppl r using. I use natural peanut butter and it has more of an earthy taste than say, Jiffy. I haven’t tried these yet but I’m torn between using mayo or PB. I used Jif natural and it was delicous. We love these, I have made them several times with great results. Who would have thought Peanut butter would taste so good in burgers. I tried this last night and it was muy bueno. I used oversized piece of parchment paper and poured off the fat each time I took out of the oven. Made the big patty about 1 1/2 inches bigger all around the dinner rolls and it shrunk down just right. Think you could do with 1 lb or 1 1/4 lb ground beef and know you only need 6 slices of American cheese or 12 slices Velveeta. Used American. I made some of these, and they came out fantastic. I have a baking pan with a plastic cover, let them sit in the fridge in that pan over night, were even better the next day. I did modify it a bit and use tahini instead of peanut butter. Great idea using tahini– similar taste but probably not as sweet! This was really tasty! I used mayo instead of PB since we have an allergy in the house. My burgers were a little too thick, it made 9 instead of 12 but they were still totally cooked through using the stated cooking directions. I did have to drain the liquids from the pan at about the 20 minute mark, there was soooo much liquid from all the onions and meat that it just had to be done. I made a quick burger sauce using mayo, ketchup and sweet relish. Very tasty, ty for the recipe! I made these a second time and improved the recipe to suit our tastes. What I did differently was I sauteed the onions on the stove to get them starting to caramelize. I like the flavor of onions cooked this way. I added them to the meat then topped with the cheese and baked for the last 10 minutes or so, until the cheese was melted. This to me improved the taste. A side bonus was there was much, much less liquid on the pan while baking. They were perfect, my problem was my own fault, my bread wasnt fresh and I don’t trust my oven 🙁 But the test is almost dead on. It will be ok! It should turn out just fine. These are awesome!!! We think they are even better than the white castles and we love white castle. I have been asked for the recipe after a friend of ours stopped in right after they came out of the oven he couldn’t get enough of them. Thank you, Colleen! I’m so glad you like the sliders! This was a great recipe! We used ground chuck, we used Velveeta cheddar slices and Sara Lee Hawaiian style dinner rolls. We were very nervous because White Castle cheeseburgers are our thing (NY)- we are now in NC and always crave WC- the frozen is not an option. Can I tell you- this recipe is SPOT ON! I wish I could share the picture- thank you for this recipe! It’s easy, simple ingredients and of course delicious! I mince my onions and mix half of it in with the meat. Because I know that White Castle burgers are cooked with minced onions, I put a layer of them on the bottom before putting the meat on top of it. When serving, add pickle chips. More authentic. I am from Michigan but my hubby is in the Army and in a place where there are no white castles ??? ?, luckily I came across this recipe and made them tonight, they were a huge hit, I will be making these again. ???? So happy to hear they were a hit! Made these tonight, not exactly like a White Castle but still delicious, hubby loved them! Thanks, printing this recipe for sure!! Oh no! That is terrible! I’m so sorry! This was the WORST version of a standard White Castle slider I have made. Peanut butter?!? I tried this recipe with trepidation but proceeded in the name of science. If the OP actually has taste buds and has actually eaten a White Castle burger then they would never have released this abomination out to the public. I’m pissed and want my 1.5 lb ground beef back. Sorry you didn’t like this recipe! We have found that others have loved it– what would you change about it? Nice reply. You are a class act! I guess there’s one in every crowd! The recipe is great; family loved it and the peanut butter only adds to the creaminess. Maybe it was the chef Joel and not the recipe that was the issue! I made these tonight. Even my daughter who basically lives in plain pasta ate them and loved them. Thank you!!! These are awesome. I’m always hesitant trying recipes using meat (we use organic, so it’s always expensive ). And then there’s the odd addition of peanut butter. But, figured we’d give it a go. So glad I did!! These are divine. I’ll be making these things in bulk and freezing them. Thank you! I made these Friday night for my family. They were Uhhh-mazing!! I could taste the peanut butter a bit but I think that’s because I knew it was there. My family made no mention of it and of course, I didn’t tell them. I used 90% lean ground beef and dried minced onion, a compromise since I like onions but my husband does not. All in all, a good copycat recipe that I will definitely make again! Thanks for sharing. Thank you for this recipe! These are the closest thing I can get to a White Castle! I grew up in northern KY and on White Castles. Now living in FL, frozen White Castle and Krystal just can’t compare! I will be making these from now on! So glad you like them! I agree, the frozen ones just don’t taste right. Thanks for the nice comment! I no longer liver where there are White Castles. We had friends staying with us and the discussion of local foods came up and White Castles was at the top of the list. When I return to Cincinnati, White Castle and Dixie Chili are the places I go even before I visit relatives. I followed this recipe to the leltter and was pretty disappointed. Too much meat. White Castles are not thick hamburgers. Too much cheese with 12 slices and Velveta was not the right cheese. Had little resemblance to a White Castle slider. Very disappointing. If I had cut the meat in half and not layered the cheese, it might have been more desirable a dish. Awesome! This slider recipe is spot-on. The taste was very close to the real thing but even better. I think that’s cause my cookie sheet is small, so they came out a little thick and oh man, are they juicy and delicious. Yields a whole bunch of burgers and they keep in the fridge quite well for later. Thanks for sharing. So glad you liked it! Good idea using a smaller dish so they are thicker. YUM! I remember White Castle from 1968 or so when they were 10¢ apiece—and I started learning how to cook back then too.…and I can tell you one thing guaranteed: These ingredients are too divergently strange, and calls for WAY too much sodium. Eccch! This recipe is too complicated. It’s nowhere NEAR the White Castle recipe. Burgers are simple, an important factor in maintaining equitable profit margins in the fast food industry. This? It’s literally a recipe for financial disaster. The end product might taste CLOSE to White Castle, but I’m telling you: It’s not bloody close enough. Look elsewhere for a more accurate recipe. I live in NJ and have ready access to White Castle. With all the allergies to it. You will want to use the 18×13 size baking sheet. Hope this helps! Spot on! We were really surprised. The first time we made these we were thought wow that is a lot of steps. After you make them once super easy and quick. We used an onion and a half instead of just one and made sure the peanut butter was a tablespoon not a heaping tablespoon. Wonderful! Thanks so much for sharing. Thank you so much for coming back to let us know how you liked this recipe! It definitely gets easier each time you make it. It seems like a lot of steps but the steps are all pretty easy.. nothing too complicated 🙂 I am all about adding extra onion, YUM! Thanks for the 5-stars! Made these tonight and they were a hit!!!!!! Thanks so much for the recipe. Yay! You are very welcome, Emma! So glad that you liked them! Hello! do you grease the baking sheet before laying the meat, or is it okay to do without? You don’t need to grease the baking sheet. The meat has enough in it that it won’t stick to the pan. Thanks for asking! I live in chicago but WC is so expensive now like 1.00 a burger. I had a friend make another recipe out of spam and onion soup mix with a pickle and cheese in top to the lil pepridge farm rolls and then you bake them and they were dead on WC just smaller finger sized appetizers. If you can try to find simething along that recipe it was a hit and tasted just like WC. Thank you for the idea! We’ll give it a try! We all live in the west and don’t have White Castle restaurants in our area, but we do occasionally travel to areas that do. We will keep this copycat recipe in mind as one to try soon. PEANUT BUTTER?? You know what? I’m trying it. The nearest White Castle is an 8 hour drive away, and I miss the taste! My husband has NEVER had one before, but loves the frozen stuff! These are delicious and have become a favorite of my husband who loves White Castle. We use King’s Hawaiian Sweet Rolls, I tried dinner rolls the first time but there was too much bread to meat ratio. We also use Pepper Jack cheese, he loves the jalapeno cheese sliders and I tried jalapeno cheese but it’s a little hard to find and I feel like pepper jack makes it seem “fancier”. Paired with the King’s Hawaiian rolls, it has the perfect sweet and savory combo with a little kick. I’m so glad you like them! Pepper jack sounds so yummy with these! I love the White Castle burger. Your recipe is even better! I used the Hawaiian sweet rolls when I made the burgers and they are incredible. I usually make up my own recipes but these are a big winner!! Thank you so much for the nice comment! So glad that you liked them so much! Made these tonight. They were SO delicious. We do not have White Castle here in GA, we have Krystals. These were WAY better than Krystal. My whole family loved them and asked to be put on the dinner rotation for the month! Not one person tasted the peanut butter. My son who eats nothing, ate 3. Hey, if we can get a 3-year-old to eat it (and LIKE it), it’s a WIN! Thank you so much for sharing! So glad you and your family loved this recipe! Thanks for the 5-stars!